Stroke and cerebrovascular disorders are important causes of morbidity and mortality in children; they are already amongst the top 10 causes of childhood death and are probably increasing in prevalence. Acute treatment of stroke syndromes in adults is now evidence based. However, paediatric stroke syndromes are far less common and the differential diagnosis is very wide, but the individual health resource implications are much greater because of the life-long treatment costs in survivors. Recognition and consultation with a paediatric neurologist should be rapid so that children can benefit from regional services with emergency neurological, neuroradiological and neurosurgical intervention and paediatric intensive care. This review focuses on the epidemiology, presentation, differential diagnosis, generic/specific emergency management and prognosis of acute stroke in children. Its aim is to educate and guide management by general paediatricians and to emphasise the importance of local guidelines for the initial investigation and treatment and appropriate transfer of these children. Stroke and cerebrovascular disorders are important causes of morbidity and mortality in children; they are already amongst the top 10 causes of childhood death and are probably increasing in prevalence. Recent epidemiological data suggest incidence rates of 2–5/100 000 children/year for childhood stroke (at least 300 a year in the United Kingdom),1 with a peak in the first year of life. Boys are at higher risk than girls. The incidence may have increased over the last 25 years as a consequence of increased recognition, less invasive vascular diagnosis (MR/CT angiography) and therapeutic advances allowing children with predisposing conditions (eg, congenital heart disease, anaemias, malignancy, meningitis) to survive. However, this trend may be offset by screening and primary prevention strategies in those at risk (eg, with sickle cell disease, (SCD).2 3 Neonatal stroke is more common, with an incidence of up to 63 per 100 000 live births.4 Health care utilisation is not adequately reflected by incidence figures but is more appropriately described by disease outcome. As well as a 20% mortality and a high recurrence rate, at least half of the survivors of these events have permanent cognitive or motor disability.1 2 4 Rapid recognition5, investigation6 7 and appropriate management5–8 (boxes 1 and 2, figs 1–5) should improve these disappointing figures. Neuroimaging in children with stroke. 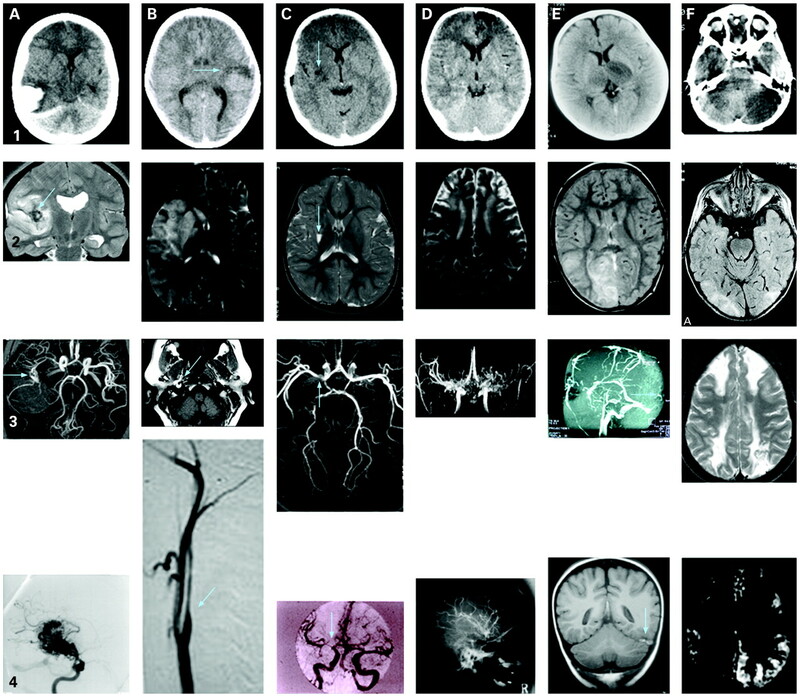 Row 1: CT scans; row 2: T2-weighted MRI scans; row 3: vascular imaging (A–D: magnetic resonance angiography (MRA); E: MR venography (MRV); F: watershed infarction); row 4: additional imaging which may be useful in difficult cases (A–D: conventional angiography; E: venous thrombosis on MRI; F: potentially reversible signal abnormality on diffusion weighted imaging). Column 1: haemorrhage; column 2: extracranial dissection; column 3: transient cerebral arteriopathy; column 4: moyamoya; column 5: venous sinus thrombosis; column 6: posterior circulation stroke and stroke mimics – posterior leukoencephalopathy, “covert” watershed ischaemia, hemiplegic migraine. A: Haemorrhage; A1: spontaneous intracerebral haemorrhage with midline shift; A2: MRI showing haemorrhage from mycotic aneurysm in a patient with subacute bacterial endocarditis; A3: mycotic aneurysm on MRA; A4: conventional arteriography showing arteriovenous malformation. B: Dissection; B1: infarct in a child who had suffered a minor head injury 24 h before; B2: large cerebral infarct after head injury; B3: fat-saturated T1 MRI of the neck showing haemorrhage in the vessel wall; B4: conventional arteriography showing tapering “rat’s tail” appearance characteristic of extracranial dissection. C: Transient cerebral arteriopathy; C1: infarct in a child with stuttering stroke onset; C2: infarct in a child with recent varicella; C3: short segment of middle cerebral artery stenosis (MRA from child in C2); C4: conventional arteriography from child in C1 showing longer segment of middle cerebral artery stenosis (the infarct had extended in size on the post-arteriography CT scan). D: Moyamoya; D1: bilateral frontal infarction in a child with livedo reticularis; D2: bilateral frontal infarction in a child with sickle cell anaemia; D3: bilateral middle cerebral artery stenosis with collateral formation obvious on MRA; D4: conventional arteriography showing attenuation of major intracranial vessels and collaterals. E: Venous sinus thrombosis; E1: bilateral thalamic signal change in severe iron deficiency anaemia; E2: occipital signal change in nephrotic syndrome; E3: sagittal sinus thrombosis in systemic lupus erythaematosus presenting with psychiatric symptoms; E4: transverse sinus thrombosis on plain MRI in child in E1. F: Posterior circulation stroke and stroke mimics; F1: cerebellar infarction in a boy with vertebral dissection; F2: bilateral occipital signal change suggestive of posterior leukoencephalopathy; F3: bilateral watershed infarction after facial infection in sickle cell anaemia (MRA and MRV were normal); F4: diffusion-weighted imaging shows potentially reversible pathology in a patient with hemiplegic migraine and normal T2-weighted MRI. 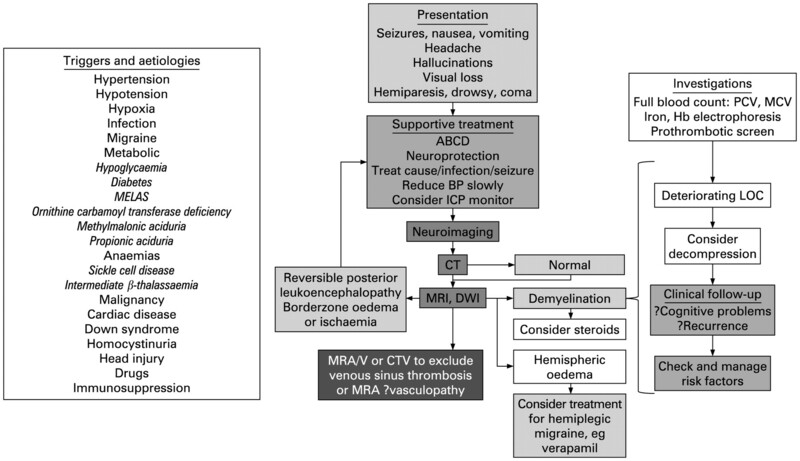 Flow diagram for the diagnosis and management of haemorrhagic stroke. ABCD, airway, breathing, circulation, disability; AVM, arteriovenous malformation; BP, blood pressure; CT, computed tomography; CTV, CT venography; ICH, intracerebral haemorrhage; ICP, intracranial pressure; IIH, idiopathic intracranial hypertension; LOC, level of consciousness; LP, lumbar puncture; MCV, mean cell volume; MRA, magnetic resonance angiography; MRV, magnetic resonance venography; PCV, packed cell volume; SAH, subarachnoid haemorrhage; US, ultrasound. 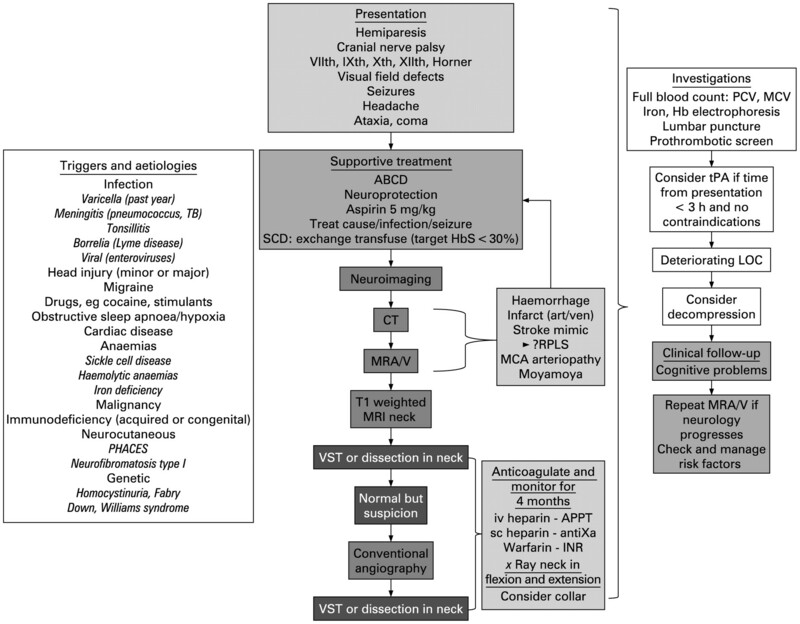 Flow diagram for the diagnosis and management of haemorrhagic stroke. ABCD, airway, breathing, circulation, disability; MCA, middle cerebral artery; MRA, magnetic resonance angiography; MRV, magnetic resonance venography; PHACES, posterior fossa malformations, haemangiomas, arterial anomalies, cardiac defects, eye abnormalities, and sternal or ventral defects; RPLS, reversible posterior leukoencephalopathy syndrome; SCD, sickle cell disease; VST, venous sinus thrombosis. 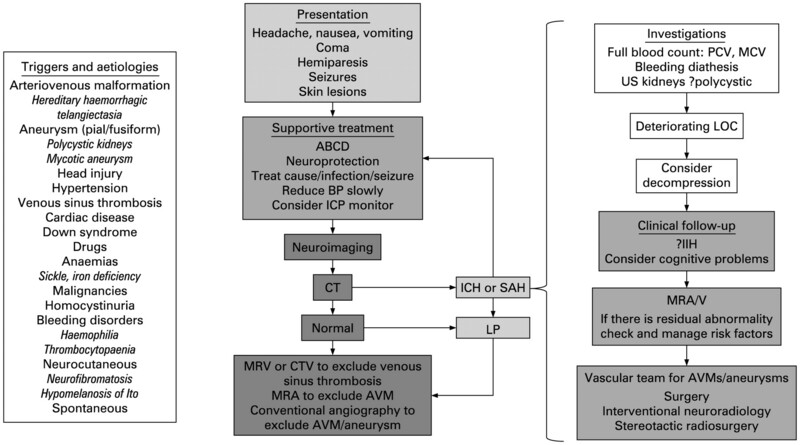 Flow diagram for the diagnosis and management of venous sinus thrombosis. IIH, idiopathic intracranial hypertension. ABCD, airway, breathing, circulation, disability; CTV, computed tomography venography; LOC, level of consciousness; MRV, magnetic resonance venography. Flow diagram for the management of stroke mimics. ABCD, airway, breathing, circulation, disability; BP, blood pressure; CTV, CT venography; DWI, diffusion weighted imaging; LOC, level of consciousness; MRA, magnetic resonance angiography; MRV, magnetic resonance venography. At least a third of cases of childhood stroke occur in the context of infection,14 and the importance of prior varicella infection as a risk factor for cryptogenic AIS and haemorrhage has recently been recognised and is apparently secondary to direct infection of the arterial wall, although secondary pathophysiologies, including transient protein C and S deficiency, may play a synergistic role.14 28–31 High leukocyte count is a risk factor for first haemorrhagic stroke in SCD,11 as well as being a risk factor for recurrent AIS.23 Host immunity and the cytokine milieu are probably important factors affecting endothelial function and cellular adhesion. The very different nature of the vascular, coagulation and nervous systems in neonates, infants and children means that clinical and radiological presentations are different from adults. AVMs (fig 1A4) are defined by the presence of high flow arteriovenous connections without an intervening capillary network (a consequence of abnormal developmental vascular remodeling).7 9 Cavernous angiomas probably result from venous hypertension and are multiple lesions (intra- or extracranial) in 13% of sporadic and 50% of familial cases. Aneurysms are relatively rare in children; 10–15% are post-traumatic and a similar proportion are mycotic (fig 1A2, 1A3). VST may also cause intracerebral and subarachnoid haemorrhage. For haemorrhagic strokes, underlying conditions which may require active exclusion include hereditary haemorrhagic telangiectasia, polycystic kidney disease, Ehler-Danlos syndrome type IV, anaemia and hypertension as well as bleeding disorders (fig 2). Moyamoya is the Japanese for “puff of smoke” and describes a cerebral arteriopathy with bilateral severe stenosis/occlusion of the terminal internal carotid arteries (ICAs) associated with the development of basal collateral vessels.37 It may be primary or secondary to SCD, Down syndrome or cranial irradiation. Moyamoya is an independent risk factor for recurrent stroke and TIA,23 which are probably reduced after extracranial-intracranial revascularisation. Vein of Galen malformation (VGAM) is an embryonic arterio-venous fistula occasionally presenting with catastrophic neonatal heart failure which within centres with an experienced multidisciplinary team may be endovascularly palliated38; it is usually inappropriate to manage any associated hydrocephalus separately. Sturge Weber syndrome (SWS) is characterised by a facial capillary haemangioma and venous angiomata of the leptomeninges/choroids associated with intractable epilepsy (which may require hemispherectomy)39 and episodic stroke-like episodes leading to progressive hemiplegia and learning disability (reduced with prophylactic aspirin39). These are diagnoses of exclusion which should only be made after discussion with a paediatric neurologist or intensivist. There may be a family history. EEG usually shows unilateral slow background activity. The demyelination is usually obvious on MRI. Intravenous methyl prednisolone probably reduces the duration of the illness and perhaps improves long term outcome. This is characterised by seizures, disorders of consciousness, visual abnormalities and headaches associated with posterior white matter abnormalities on CT/MRI and has been described after acute chest syndrome in SCD,40 after hypertensive encephalopathy and during immunosuppression. The majority of patients make a full clinical and radiological recovery after careful treatment of their underlying condition, although infarction in the parieto-occipital or watershed (fig 1F3) can occur.40 If RPLS is associated with hypertension, the blood pressure should be reduced very slowly to avoid precipitous drops and infarction. Vertebrobasilar dissection, which may present with ataxia, visual disturbance or coma rather than hemiparesis (figs 1F1, 3) and which is much commoner in boys,34 and VST (figs 1E, 4) are part of the differential diagnosis and should be excluded on emergency imaging as their treatment and prognosis are different. There are often clinical clues to the aetiology of metabolic stroke, for example persistent vomiting, hypoglycaemia or diabetes. Organic acidaemias, urea cycle disorders and mitochondrial disorders can cause stroke-like episodes with imaging abnormalities in an atypical vascular distribution. Homocystinuria and Fabry disease are usually associated with cerebrovascular disease. Although stroke in childhood is relatively rare, its clinical presentation is usually obvious to the paediatrician, who can investigate both obvious and subtle presentations and initiate emergency medical management. Hemiplegia, headache, seizure or altered levels of consciousness may all herald a potentially reversible or lethal medical or surgical stroke emergency. If a stroke syndrome is suspected, initial resuscitation in conjunction with the local anaesthetic/intensive care team should be followed by consultation with regional paediatric neurological services before further imaging, investigation or treatment are planned and instituted. Although stroke is traditionally defined as a neurological deficit lasting for ⩾24 h, many children with a TIA lasting ⩽24 h have had a recent cerebral infarction/haemorrhage on imaging. In addition to the underlying diagnosis (figs 2–5), the time from onset of symptoms to presentation is very useful diagnostically, for example arteriopathy is more likely to present with a stuttering onset,41 suggesting the need for imaging to exclude dissection (fig 1), and “thunderclap” headaches may be indicative of a subarachnoid haemorrhage warranting lumbar puncture even if neuroimaging is normal. Stroke mimics may be benign and require no treatment, but in some cases timely intervention prevents neurological disability or death.5 18 Emergency MR provides information that can guide management in individual children (figs 2–5). Any financial consequences of over-investigation that this approach may produce will almost certainly be overridden by the potential benefits in terms of reduced healthcare and socio-economic costs resulting from prompt and appropriate treatment. If immediate transfer is deemed necessary after discussion with the on-call neurosurgeon or paediatric neurologist, liaison with the regional paediatric intensive care unit (PICU) is advisable. Children may present in coma, status epilepticus, or with signs of intracranial hypertension or imminent herniation mandating liaison with local anaesthetic teams/regional PICUs, and appropriate retrieval/transport of children to regional centres for further imaging/management. No studies have specifically examined the effect of the loss of cardio-respiratory integrity on stroke outcome in children. However, based on principles which would be applied to the care of any acutely ill child (ABCD, airway, breathing, circulation, disability) including the maintenance of adequate oxygenation (non-invasively estimated by pulse oximetry), cardiac output, systemic and cerebral perfusion pressure, and tight control of blood glucose and body temperature should be the aim. Hypertension should not be treated unless intracranial pressure is monitored if there is a space-occupying lesion, and should only ever be lowered slowly. Children whose level of consciousness deteriorates should be ventilated and transferred to the nearest neurosurgical/PICU in case they require drainage of a haematoma, ventriculostomy for hydrocephalus or craniectomy for intractable intracranial hypertension. Management may be guided by intracranial pressure monitoring, which should be considered in children who remain sedated and in whom there is radiological/clinical suspicion of a space-occupying lesion. Seizures in the acute phase should be managed aggressively in accordance with conventional algorithms and local guidelines as they significantly increase the cerebral metabolic rate for oxygen and can thus unfavourably affect the substrate supply–demand balance. Consideration should be given to continuous cerebral function monitoring in paralysed children. Haemorrhagic stroke or AIS with mass effect should be excluded by emergency CT, which might also show some evidence of focal ischaemic damage but often only from 24 h after presentation. If CT is not available immediately at the local site, discussion with a tertiary centre is mandatory and urgent consideration should be given to transfer of the child, even if this can only be achieved safely by intubation and ventilation. The regional PICU should be involved in this decision, as this is an emergency. If immediately available, MR with diffusion weighting has advantages over CT as haemorrhage can be diagnosed or excluded (fig 1A2), RPLS (fig 1F2), hemiplegic migraine (fig 1F4) and ADEM can be distinguished from ischaemic stroke and venous or arterial pathology can usually be identified and this may alter acute management, which in turn may reduce the extent of the eventual infarct. VST may be accompanied by infarction (sometimes haemorrhagic), typically in a parietal, occipital (fig 1E2), frontal or thalamic (fig 1E1) distribution17; if the diagnosis is not obvious on plain CT or MR (fig 1E4), emergency CT or MR venography (fig 1E3) should be considered for all strokes unless there is obvious arterial pathology, so that anticoagulation can be considered (see below). For AIS, if MRA is not diagnostic, T1-weighted spin echo of the neck with fat saturation should be performed to exclude dissection (fig 1B3) as, again, these patients should be considered for anticoagulation. Although there is a 1% risk of stroke, highest with intracranial stenosis (fig 1C4), conventional angiography may be required for the diagnosis of small vessel vasculitis, cortical venous thrombosis and sometimes for the diagnosis of dissection (fig 1B4), particularly in the posterior circulation,34 as well as for the pre-surgical anatomical definition of moyamoya (fig 1D4), AVM (fig 1A4) or aneurysm. The management strategy should ensure optimal intravascular volume, normothermia and normoglycaemia. A neurosurgical opinion is mandatory for the discussion of haematoma drainage and the management of complications, including hydrocephalus, vasospasm, perihaematomal oedema and brain shift. Intracranial pressure monitoring and osmotherapy targeted at maintaining an adequate cerebral perfusion pressure may be required. Fluid restriction is not advisable initially but may be initiated if there is evidence of inappropriate ADH release. Vasospasm may complicate subarachnoid haemorrhage, is detectable by transcranial Doppler (TCD) and treatable with calcium channel antagonists. Blood pressure control is a controversial topic as perfusion pressure must be maintained while the risk of recurrent haemorrhage may mandate avoidance of hypertension before definitive vascular treatment. If there is an underlying AVM or aneurysm, the recurrence risk9 means that a vascular team with considerable experience should evaluate and decide between the management options (neurosurgery, neuroradiology or stereotactic radiotherapy) once the patient has recovered from the acute phase. All stroke syndromes are potential neurosurgical emergencies and should be discussed with a consultant paediatric neurologist on presentation. Further management and any transfer may involve liaison with the nearest available PICU. The population with sickle cell disease provides an ideal model for proactive stroke prevention as the majority of strokes are predicted by TCD. Blood transfusion is a mainstay of stroke prevention42 as well as acute stroke management. Transfusion should commence within 2–4 h of presentation with neurological deficit; emergency exchange, rather than top-up, transfusion at the time of first stroke appears to be associated with a reduced risk of recurrence.43 The aim is to reduce the HbS % to ⩽30% with a haematocrit of >30%. Pathology can include haemorrhage,11 VST,17 RPLS,40 acute necrotising encephalitis and arterial dissection as well as territorial infarction secondary to arterial stenosis and “silent” or covert injury, generally in the watershed regions (fig 1F3) and often associated with transient neurological symptoms and signs rather than overt stroke. If available, emergency MR may guide management. Despite a little published experience,44 which is almost certainly biased in favour of positive outcomes, there is no evidence to support the use of tPA in the acute management of childhood stroke.6–8 Although children may present <3 h after stroke, its rarity, the low sensitivity of CT for acute infarction and the wide differential in this age group means that very few children are diagnosed in the time window described in adult trials of acute intervention in stroke. Generally, thrombolysis is contraindicated. Very occasionally, and only as part of a strict research protocol, thrombolysis, with intravenous tissue plasminogen activator (tPA) within 3 h or intra-arterial tPA within 6 h, may be considered for middle cerebral artery occlusion, or for basilar occlusion, within 12 h, perhaps with balloon angioplasty. If intracranial hypertension persists or there is evidence of impending herniation despite maximal medical therapy, decompressive craniectomy should be considered for AIS, VST and stroke mimics. Patients with hydrocephalus secondary to large cerebellar infarcts may need ventriculostomy or cerebellectomy. Physio-, occupational and speech therapists should be available for children soon after stroke as part of the multidisciplinary team. Long term rehabilitation should include cognitive,46 as well as physical, domains. As there is a wide range of differential diagnoses, which may be difficult to recognise,4 18 47 and the multidisciplinary expertise available in stroke units has been shown to improve outcome in adults,48 it is important that communication between primary, secondary and tertiary services facilitates the child’s pathway through acute diagnosis and treatment as well as longer term rehabilitation and secondary prevention. Further multi-centre, multi-national studies of epidemiology and risk factors for primary and secondary stroke should be urgently undertaken through collaborations such as the International Paediatric Stroke Study. We must then use these observational data to encourage and adequately power randomised interventional studies to establish appropriate evidence based guidelines for the treatment of this potentially salvageable paediatric emergency.
. Is it time for a large, collaborative study of pediatric stroke?Stroke2005;36:1825–9.
. Clinical outcomes in children with sickle cell disease living in England: a neonatal cohort in East London.Haematologica2007;92:905–12.
. Preventing stroke among children with sickle cell anemia: an analysis of strategies that involve transcranial Doppler testing and chronic transfusion.Pediatrics2007;120:e1107–16.
. Acutely and retrospectively diagnosed perinatal stroke: a population-based study.Stroke2007;38:2234–40.
. Diagnostic pitfalls in paediatric ischaemic stroke.Dev Med Child Neurol2006;48:985–90. Royal College of Physicians Paediatric Stroke Working Group. Stroke in childhood: clinical guidelines for diagnosis, management and rehabilitation.Available from http://www.rcplondon.ac.uk/pubs/books/childstroke/childstroke_guidelines.pdf (accessed 4 July 2008).
. Management of stroke in infants and children: a scientific statement from a Special Writing Group of the American Heart Association Stroke Council and the Council on Cardiovascular Disease in the Young.Stroke2008;39:2644–91.
. Antithrombotic therapy in neonates and children: American College of Chest Physicians Evidence-Based Clinical Practice Guidelines (8th Edition).Chest2008;133(6 Suppl):887S-968S.
. Recurrent hemorrhagic stroke in children: a population-based cohort study.Stroke2007;38:2658–62.
. Is there a role for magnetic resonance imaging in the evaluation of non-traumatic intraparenchymal haemorrhage in children?Pediatr Radiol2006;36:940–6.
. Primary hemorrhagic stroke in children with sickle cell disease is associated with recent transfusion and use of corticosteroids.Pediatrics2006;118:1916–24.
. Prognosis of haemorrhagic stroke in childhood: a long-term follow-up study.Dev Med Child Neurol2003;45:233–9.
. Recurrent thromboembolism in infants and children suffering from symptomatic neonatal arterial stroke: a prospective follow-up study.Stroke2003;34:2887–92.
. Investigation of risk factors in children with arterial ischemic stroke.Ann Neurol2003;53:167–73.
. Cerebral sinovenous thrombosis in children.N Engl J Med2001;345:417–23.
. Cerebral venous thrombosis in children: a multifactorial origin.Circulation2003;108:1362–7.
. Venous sinus thrombosis in children.Brain2005;128:477–89.
. Mimics of childhood stroke: characteristics of a prospective cohort.Pediatrics2006;118:704–9.
. Ischemic stroke in children with critical illness: a poor prognostic sign.Pediatr Neurol2007;36:244–6.
. Risk factors for recurrent venous thromboembolism in the European collaborative paediatric database on cerebral venous thrombosis: a multicentre cohort study.Lancet Neurol2007;6:595–603.
. Outcome after ischaemic stroke in childhood.Dev Med Child Neurol2000;42:455–61.
. Prospective assessment of risk factors for recurrent stroke during childhood – a 5-year follow-up study.Lancet2002;360:1540–5.
. Recurrence after childhood ischemic stroke.Circulation2006;114:2170–7.
. Risk of recurrent childhood arterial ischemic stroke in a population-based cohort: the importance of cerebrovascular imaging.Pediatrics2007;119:495–501.
. Association between iron-deficiency anemia and stroke in young children.Pediatrics2007;120:1053–7.
. Hyperhomocysteinemia: a risk for ischemic stroke in children.Circulation1999;99:2070–2.
. Lipoprotein (a) and genetic polymorphisms of clotting factor V, prothrombin and methylenetetrahydrofolate reductase are risk factors of ischaemic stroke in childhood.Blood1999;94:3678–82.
. Varicella as a risk factor for cerebral infarction in childhood: a case-control study.Ann Neurol1999;45:679–80.
. Chickenpox and stroke in childhood: a study of frequency and causation.Stroke2001;32:1257–62.
. Clinical and radiological features of childhood cerebral infarction following varicella zoster virus infection.Dev Med Child Neurol2007;49:417–22.
. Post-varicella intracranial haemorrhage in a child.Dev Med Child Neurol2006;48:139–42.
. Arterial dissection and stroke in children.Neurology2001;57:1155–60.
. Craniocervical arterial dissection in children: clinical and radiographic presentation and outcome.J Child Neurol2006;21:8–16.
. Posterior circulation stroke in childhood. Risk factors and recurrence.Neurology2002;59:1552–6.
. Transient cerebral arteriopathy: a disorder recognized by serial angiograms in children with stroke.J Child Neurol1998;13:27–32.
. Evolution of cerebral arteriopathies in childhood arterial ischemic stroke.Ann Neurol2006;59:620–6.
. Revascularisation surgery for paediatric moyamoya: a review of the literature.Childs Nerv Syst2005;21:358–64.
. Neurodevelopmental outcome after endovascular treatment of vein of Galen malformations.Neurology2003;61:1386–90.
. Central nervous system structure and function in Sturge-Weber syndrome: evidence of neurologic and radiologic progression.J Child Neurol1998;13:606–18.
. Reversible posterior leukoencephalopathy syndrome and silent cerebral infarcts are associated with severe acute chest syndrome in children with sickle cell disease.Blood2003;101:415–19.
. Mode of onset predicts etiological diagnosis of arterial ischemic stroke in children.Stroke2007;38:298–302. Adams RJ, Brambilla D, Optimizing Primary Stroke Prevention in Sickle Cell Anemia (STOP 2) Trial Investigators. Discontinuing prophylactic transfusions used to prevent stroke in sickle cell disease.N Engl J Med2005;353:2769–78.
. Exchange blood transfusion compared with simple transfusion for first overt stroke is associated with a lower risk of subsequent stroke: a retrospective cohort study of 137 children with sickle cell anemia.J Pediatr2006;149:710–12.
. Thrombolysis for ischemic stroke in children: data from the nationwide inpatient sample.Stroke2007;38:1850–4.
. Aspirin versus low-dose low-molecular-weight heparin: antithrombotic therapy in pediatric ischemic stroke patients: a prospective follow-up study.Stroke2001;32:2554–8.
. A pilot randomized education rehabilitation trial is feasible in sickle cell and strokes.Neurology2007;68:2008–11.
. Stroke and cerebrovascular disease in childhood. International Child Neurology Association and MacKeith Press, 2009.In press. Stroke Unit Trialists’ Collaboration. Organised inpatient (stroke unit) care for stroke.Cochrane Database Syst Rev2007;(3):CD000197. Funding: FJK was funded by the Wellcome Trust (0353521 B/92/2), Action Medical Research and the British Heart Foundation and benefited from R&D funding received from the NHS executive. © Pappachan et al 2008 This is an open-access article distributed under the terms of the Creative Commons Attribution Non-commercial License, which permits unrestricted use, distribution, and reproduction in any medium, provided the original work is properly cited.